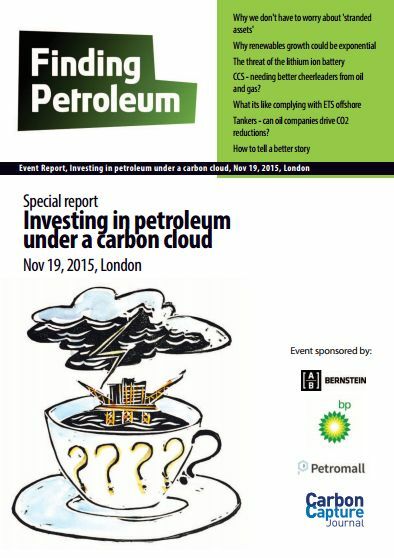 Finding Petroleum's forum on Nov 19 "Investing in Petroleum under a Carbon Cloud" looked at the best way that the oil and gas industry can work together with current climate concerns. Finding Petroleum was established to help the oil and gas industry network, and stay up to date on the latest technological developments. It does this via hosting regular events and with an online social network of nearly 10,000 members. Teng Ben was formerly Business Development Lead Analyst, Portfolio Management, E&P division with ENI, and Analyst - Oil, Gas & Renewables with Standard Bank. She has an MSC in Financial Economics from Said Business School, University of Oxford. Sanford C. Bernstein is widely recognized as Wall Street's premier sell-side research firm. Their research is sought out by leading investment managers around the world, and they are annually ranked at the very top of acknowledged arbiters. In independent surveys of major institutional clients, Bernstein's research is ranked #1 for overall quality, industry knowledge, most trusted, best detailed financial analysis, major company studies, most useful valuation frameworks, best original research, and most willing to challenge management. In Institutional Investor's 2008 annual client survey, the leading survey by which analysts in our industry are evaluated, 100% of our U.S. Analysts were recognized as among the best in their respective fields -- more than any other firm on Wall Street. Raj is CEO of Preventable Surprises. Howard is chair of the Alan Turing Institute and co author of his and Raj's joint work on forceful stewardship. Preventable Surprises is about all those corporate and financial blow-ups that really should - and could - have been seen coming. Concerns about BP's safety record and the accounting practices of Tesco were both in the public domain for years before disaster struck. We are a 'think-do' tank that seeks to prevent, or at least mitigate, corporate and market implosions. Chris Davies is Former CCS rapporteur with the European Parliament. He is a former Member of the European Parliament (MEP) and a former Member of Parliament) in the MP, representing the Liberal Democrats. Understand. Act. It describes how we look at the world and how we behave. We aim to stand out as the investment partner our clients trust by listening closely to understand their challenges, then acting decisively to provide them with solutions that meet their needs. BP is one of the world's leading international oil and gas companies. We provide customers with fuel for transportation, energy for heat and light, lubricants to keep engines moving, and the petrochemicals products used to make everyday items as diverse as paints, clothes and packaging. Premier Oil plc is a leading independent oil and gas company with producing interests in the UK, Indonesia, Pakistan and Mauritania. Exploration and appraisal is ongoing in the UK, South and South East Asia and Africa. · Developed , negotiated, and gained approval for the Group Marine Standard which amongst other things covers the marine elements of FPSO’s. The standard is still in place in more or less its original form today. MOAMS,Marine Operations and Assurance Management Solutions, is a different type of consultancy. MOAMS combines a deep knowledge of marine operations with research into the future of the industry. How to move beyond Hollywood when it comes to Climate Change! I would like to challenge the narrative around climate change and the role of the fossil fuel industry in climate change mitigation. We have grown up on a narrative of Hollywood 'good guys' and 'bad guys'; the fossil fuel industry being placed squarely in the 'bad guy' camp and renewable energy in the 'good guy' camp. The change from fossil fuels to renewables is woefully slow. But we have also grown up on Hollywood scripts where someone rides in to save the day at the very last moment. We live in the real world; it's the only world we have got to live on and we need to get real. Here is how and why I believe CCS is vital in the real world narrative…. Petromall is a unique oil and gas advisory service which prides itself on technical excellence in selected fields and supplementing business management and leadership; in the face of uncertainty. We offer truthful, professional opinion and advice; no playback of what you already know, and no spin. Petromall was founded by 4 senior industry and academic practitioners who consider the challenges faced by today's oil and gas environment are going to require herculean acts of leadership and technical skill in the high cost provinces of the world, in order to maintain an industry that is sustainable and even recognisable compared to recent history. Similarly nations developing an oil and gas industry face related challenges as they seek to maximise the benefits of this new wealth-creating opportunity - in a responsible manner. Petromall actively participates in the facilitation and conduct of seminars worldwide, in conjunction with its associate partner Finding Petroleum. Our presence reaches parts of the globe, such as: the UK, Malta, the USA, through partners in the Middle East, North Africa and Sub-Saharan Africa.